In the past 70 years, Porsche has built up a reputation for delivering iconic, sweet-handling sports cars, but the cheapest way into the club isn’t a 911 – and it’s not a Macan or a Panamera, either. Instead, it’s the 718 Cayman that now sits at the very bottom of Porsche’s ever-growing price list. 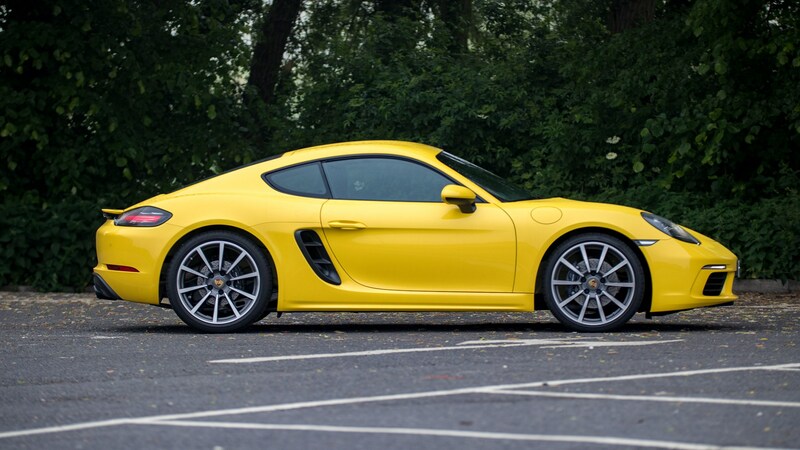 Smaller, mid-engined and more subtle than its 911 sibling, the Cayman promises equally balanced handling to the definitive Porsche model, and offers it on a considerably more lightweight budget. But does it deliver? To find out if the entry-level, turbocharged Porsche is a legitimate new strand to Stuttgart’s winning formula, read the fully updated CAR magazine review of the 718 Cayman. Porsche 718 Cayman: what’s in a name? Seven-eighteen? Has someone at Porsche been listening to that police scanner again? Sounds like code for an armed siege down at the Nürburgring trackside shop. Besides reinforcing the link to that other mid-engined Porsche sports car, the mega-money 918 Spyder, the 718 tag is designed to mitigate outrage that Porsche has dumped the Cayman’s (and Boxster’s) sublime flat six motors for a pair of turbo fours. That’s because the original Porsche 718s, successors to the 550s of James Dean fame, racked up dozens of racing victories back in the 1950s and 1960s, including a class win at Le Mans and outright success at the Targa Florio. And they were powered by - you guessed it - flat-four engines. Not turbocharged, though, were they? Nope. But they didn’t have 300bhp either, and this thing does. Well, 295bhp. That’s right, even the base Cayman, a car traditionally so undernourished you’d have to feign disinterest when a senior-league hot hatch came nipping at your tail, has proper punch these days. Power’s up from the 271bhp of the old naturally aspirated 2.7 boxer six, but it’s the 67lb ft jump in torque that’s made the biggest difference to how the new 2018 Porsche 718 Cayman feels. The 0 to 62mph time falls by over 0.5sec to 5.1sec, in the case of the six-speed manual, and to as little as 4.7sec if you’ve opted for the PDK transmission and then splurged for the Sport Chrono package – easily identifiable by the dash-top stopwatch and rotary drive mode selector in the steering wheel, plus the launch control feature that cuts the sprint by two-tenths over the stock PDK version. 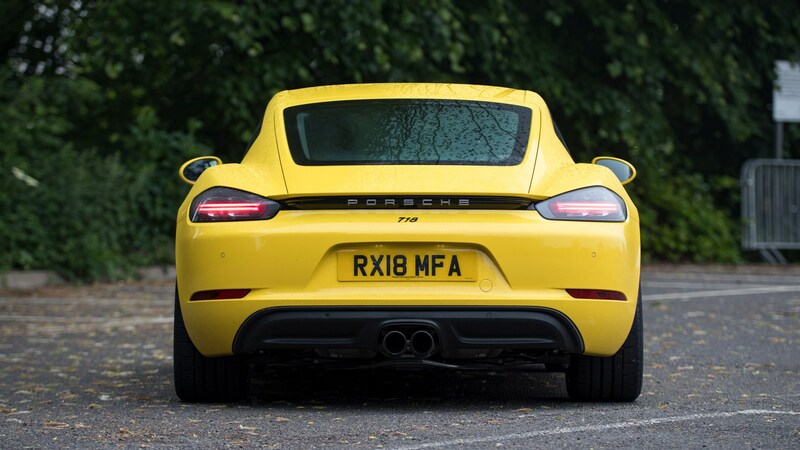 Before we get onto how the 718 Cayman feels to drive, it’s worth talking about how it sounds – because it’s one of the biggest differences to the outgoing car. Ease the clutch down, twist the car-shaped key, and you’re enveloped in a classic, grumbly flat-four soundtrack – with a heavy backbeat. Think Subaru meets Stuttgart. It’s by no means awful; the power unit's blend of gruff metallic tones is gravelly and boomy in equal measure – but inevitably it lacks the colour of the flat-six it replaces. Rev it through to the redline and there’s little light and shade, no high notes to set your neck hairs on end, just a uniform blare. The Cayman engine note is now more machine than music, but when it comes with such a boost in power, it’s hard to complain. What about the 718 Cayman S? Of course, and not just because – when using PDK and launch control – its 345bhp and 310lb ft get it to 62mph in as little as 4.2sec. The S feels more responsive because it benefits from an extra half a litre of swept volume and a lag-reducing variable geometry turbo. The extra performance lets you stretch the chassis that little bit further, too. On the road the differences are negligible. Both cars handle beautifully, displaying almost zero understeer and offering steering that’s radically improved over the Porsche’s over-damped first-gen electrically assisted systems. Venture on to a track, however, where you have the freedom to push harder, and the S’s extra power lets you play with the rear in a way you can’t in the standard car. The S gets 911-spec brakes too, to deal with the extra performance, while the base car inherits the old S set-up. Both feel superb, so don’t bother with the optional ceramics. To S or not to S? Not so fast. The S costs £48,834, compared with the £39,878 of a regular 718 Cayman – and now that Porsche has finally seen sense and inverted its Boxster-Cayman pricing structure, the soft-top is £1861 more expensive, spec-for spec. Going for a standard 718 Cayman is now the only way to put a new Porsche sports car on your drive for less than £40,000. It’s also the only Porsche sports car claimed capable of topping 40mpg on the combined cycle, which is an incredible achievement for a 170mph machine. Presumably the base car misses out on lots of kit though? Not really. This being a Porsche, the kit list on both cars is meaner than a fairytale witch – and you’ll have to fork out extra for PASM adaptive dampers, ceramic brakes, a sports exhaust, PDK gearbox, sat-nav and dual-zone climate... You get the idea. Bi-xenon lamps feature on both, but the S features 19in instead of 18in alloy rims, and partial leather trim rather than Alcantara and… leatherette. And you can’t spec the standard car with the 20mm lower PASM sport chassis pack, only the S, though it makes no financial sense to load up a base car with options anyway. We can’t help but shed a tear for the loss of the Cayman’s charismatic flat six, but the Boxster-Cayman duo is still in a league of its own. 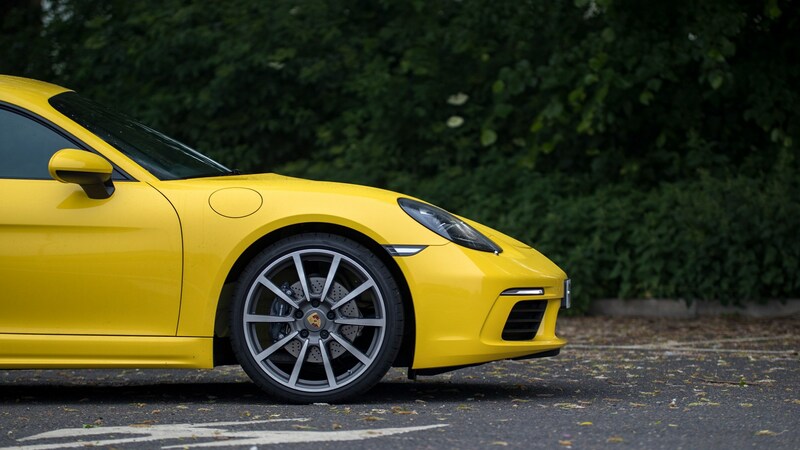 And the switch is less of a wrench in the base car, which has finally been endowed with a level of performance that you’d expect from a modern Porsche sports car. Cost no object we’d still go for the faster, more satisfying S, but the standard 718 Cayman is the smarter buy. The turbocharged Cayman is here, and it turns out that's not an altogether bad thing.